"...Everyone fears receiving a file that contains a virus; they can lurk in files from even the closest of friends. So we’re happy to announce new, enhanced file transfer security as part of the partnership between Yahoo! Messenger and Symantec. Yahoo! 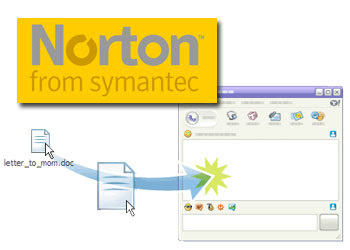 Messenger has teamed up with Symantec to provide automatic file scanning for users of Norton AntiVirus 2007/2008 and Norton Internet Security 2007/2008 (for Windows)..."